How to design hi-fi preamplifiers! Designing High-Fidelity Tube Preamps is a comprehensive guide to the design of small-signal, tube-based amplifiers. This book examines in unprecidented detail the inner workings and practical design of small signal stages, volume and tone controls, RIAA equalisation, power supplies and more. 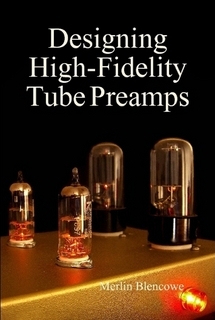 Aimed at intermediate to advanced-level hobbyists and professionals it teaches the principles of low-noise, low-distortion tube design, through easy-to-read explanations and minimal math. With over 400 diagrams and figures, and hundreds of real measurements of real circuits, it asserts itself as an essential handbook for any tube amp enthusiast. View the full contents list here. View some sample pages here. Note, the PDF is in colour but the book itself is grayscale. 12: The Cathodyne Phase Inverter, web exclusive chapter! On page 11 it reads: 15-90j+21j+126 = 141+69j but the answer is in fact 141-69j. Thanks to Heikki for spotting this! In fig. 1.56 the output sinewaves should appear inverted. On page 62 it should read "If the rate of closure is more than 40dB/decade (>12dB/octave)..." Thanks to Heikki again! On page 96 it should read: "Since the turns ratio is 4, the voltage gain should be 12dB..."
On page 101 it should read: "Fortunately the space charge is negatve and neutralises such ions..."
On page 197 table 5.2 quotes 457-11575 Hz for A-weighting equivalent noise bandwidth. The text should match this. "Possible noise advantage when used with high-ra triodes. Poorer signal-to-noise ratio when used with low-ra triodes." In fig. 11.48 a possible failure mechanism exists if the output voltage is turned all the way down with no load. This is due to the 317L not being able to sink the current through R1+R2+D1. A known fix is to increase R1 and R2 by a factor of 10 (e.g. 1Meg and 82k). Thanks to Menno van Der Veen for pointing this out.